Formed in 2009, the memorably named progressive death metal band Pile of Priests have put in the man hours for their metal, supporting legendary bands like Artillery, Vader and Immolation. 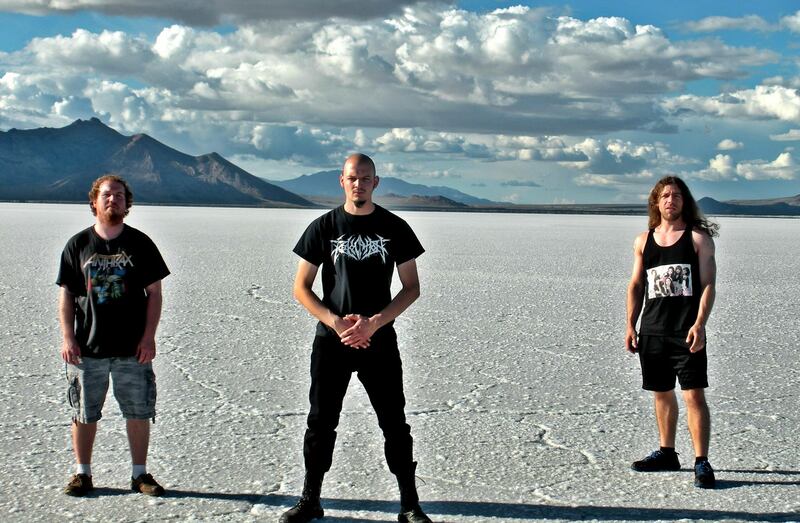 Consisting of Evan Salvador on guitar and vocals, Patrick Leyn on bass, and Evan Knight on drums, they independently released their 2015 debut album ‘Void To Enlightenment’. Never resting on their laurels, they have now recorded a new EP, consisting of three original songs and three covers, entitled ‘Tenebrous Labyrinth’ plus prior to the EP being unleashed a stand alone single ‘Redemption Per Cruciatu’. Inspired by Death, Edge of Sanity, Old Man’s Child, Cannibal Corpse and the mighty Voivod… Evan Salvador describes his band’s ‘death metal with a twist’.